"As wind and minor stomach upsets can cause a lot of pain and discomfort for infants and babies a natural alternative to treat this uncomfortable feeling is desirable. Herbalist use Dill oil to treat flatulence, stimulate appetite and to settle the stomach. Coriander eases the pain caused by spasms, stimulates the appetite and also disguises the unpleasant taste of other ingredients. Peppermint oil is a digestive aid and also helps to assimilate food. Fennel is also a digestive aid, especially n the lower intestinal area it also relieves nausea and helps the flow of digestive juices. Meadowsweet is an anti-inflammatory and antacid. It protects and soothes the mucous membranes in the digestive track and also helps to relieve diarrhoea in children. Ingredients used to treat flatulence, colic, digestive problems, heartburn and diarrhoea for hundreds of years. 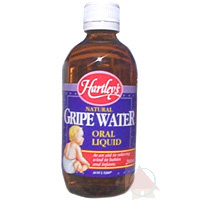 Hartley's Natural Gripe Water is used to relieve the pain of wind and minor stomach upsets in babies and infants.